Judges rarely hand out damages that are requested by the aggrieved party and the one million dollar figure is outrageous and no judge will even agree to that and see this as an extreme overreach. Not only that but the nonsense logic could apply to everyday life. DOJ: That's about $20 million in damages for that comment. $10 million of it because somehow Fox news is related. CFAA applies. The point of inflating the numbers wasn't to increase the amount that they would ask for in damages, it was to get them high enough for the CFAA to kick in, drastically boosting the possible charges. What kind of judge lets this stand? I mean, if the prosecution is of the opinion that its job is throwing as much as it can at the wall and see what sticks, I don't see it as the job of the judge to do the job of the prosecution and figure out the actually prosecutable conduct and its amount. If the prosecution does not do its job, the judge should just throw out the case completely and see what sticks (namely see whether the prosecution bothers doing its job at the appellate court). The prosecution has a job that's more serious than that of a court jester, and it should take its job more seriously than that. It represents the government's interest in letting courts find justice, and apparently this prosecutor cannot be interested in finding justice. Re: What kind of judge lets this stand? I would literally throw the prosecution at the wall and if they should happen to stick then their case sticks but if of all miracles they don't stick and fall to the ground due to gravity then their case doesn't stick at all. Some judges are more interested in seeing "bad guys" go to jail than seeing justice done. Such judges will favor the testimony of a police officer over video to the contrary, or favor an aggressive prosecutor in order to get a conviction. We've seen a lot of truly lame rulings here on TD. So we're kinda used to stupid or biased judges. Re: Some judges are more interested in seeing "bad guys" go to jail than seeing justice done. It's nearly impossible too become a judge if you are stupid, bias is whats we are looking at. You are affording them a benefit of doubt they are unwilling but are in fact sworn to grant others. 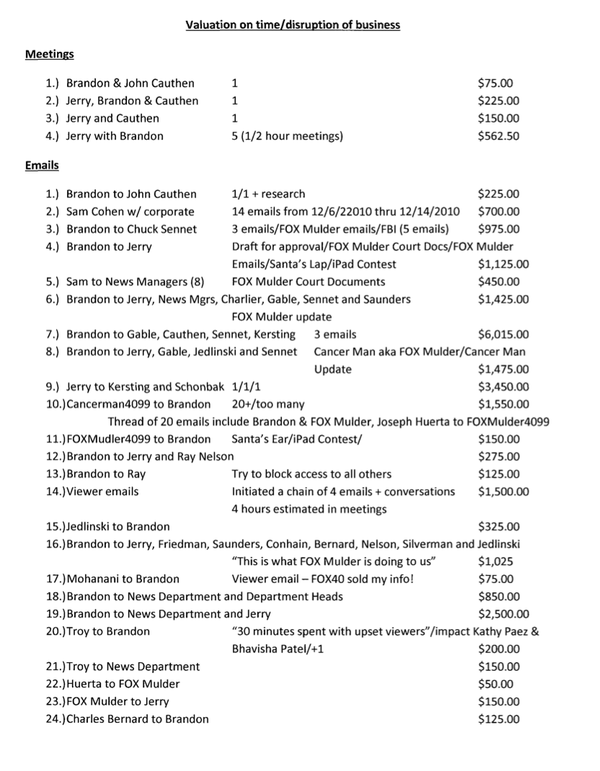 Among other absurdities, it appears that Brandon Mercer joking about Chuck Sennet billing $1000/hr was included in the email & cost estimates. So now Keys is responsible for causing Mercer to make jokes? Its sad to see that the below-the-belt tactics that were the stock-in-trade of ambulance-chaser attorneys and related bottom-feeders in the legal profession have now infected the top law-enforcement agency in the land. ... and what is that #9 item in the bill? -- Charging thousands of dollars for sending a single email? On the other hand, maybe Tribune Company was thinking about getting into the military contracting business, and was just practicing on the billing end. No clue what #9 is but I'd take that job. My personal favorite is #23 FOX Mulder to Jerry. Imagine a viewer sends them an email, never gets a reply because it went straight to the spam folder and then the viewer gets a bill for $150. I assume Mulder never got a reply because it is 2nd last on the list and "straight to spam folder" because there is not time. Thinking about it... forget the #9 job. I want to get paid $150 for every email I ignore! 1. 1/2 lunch breaks -$5000. 2. Bathroom Break - $10,000. 5. Breathing Company Air -$5000. 6. Recycling of Breathed Air -$5000. The first bill came from the news department and reflected an accurate account of the charges. Since that wasn't enough for the prosecution, they passed the job back to the movie division accountants who worked that Hollywood magic on the incident. Hollywood math at its finest! The defense should be asking if there was any other indication that the email exchanges included jokes. If not, the claim that the "$1000 per hour" should be viewed as a serious suggestion, especially since this is a criminal trial. The DOJ had best be careful about setting precedents like this. 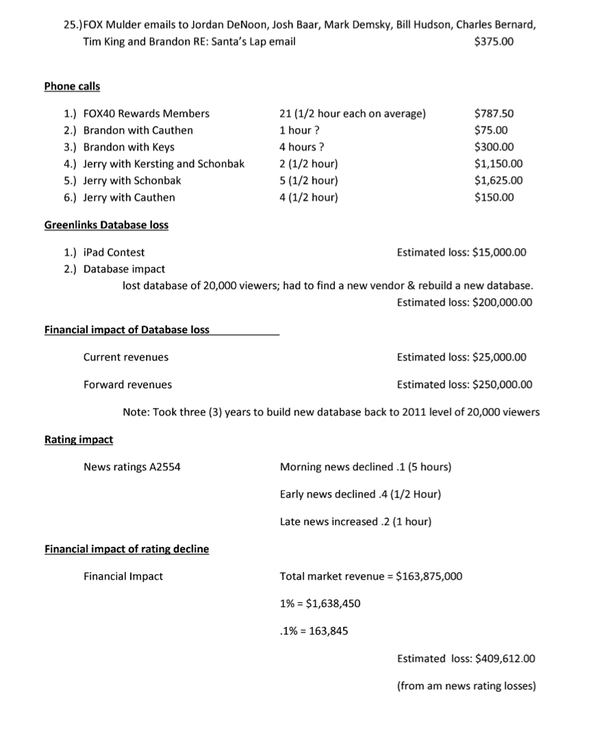 If they lose the Kim Dotcom case and he uses a similar formula for calculating what the government has cost him, could be a sovereign bankruptcy generating event. This isn't to say that he didn't send them, but that a coerced admission (and scribbled confession) is dubious evidence to that affect. I would still say, he allegedly sent the x-files emails. A few decades ago, there was a case about a stolen document and the damages where in the hundreds of thousands. Turns out they included the full cost of a secretary, the full cost of the VAX used in processing it, etc. Pretty much everything but the kitchen sink (and the cost of the house it was in) to inflate the damages as much as possible. Personally, I think the Tribune ought to be sanctioned for fraud on the court for providing testimony, under oath, that those are the true and factual damages. the prosecution have obviously been given lessons by the entertainment industries. they always manage to 'lose' millions because of illegal downloading, even if only one copy of something is downloaded and they then manage to keep all the monies, using 'Hollywood Accounting', with the artists, who the law suits are supposed to be done for, never receiving a dime!! Sounds like the Tribune Company is getting desperate, glad I don't have any money invested there. we don't need no stinking badges we can do what we want. "For what it's worth, Brandon apparently said on the stand that he was just joking, and he realizes that's not the best thing to joke about"
"Joke" about having a bomb in your suitcase at the airport and you can be locked up, even if you clearly didn't have any such thing on you. The joke is often enough to prosecute. "Joke" about lying to law enforcement specifically in order to get someone else locked up, and apparently that's fine. As long as you were joking, you're apparently not presenting falsified figures and you can get away with perjury. And some people wonder why I consider the justice system in the US to be dangerously corrupt.